Scientists this week described two new bright-eyed treefrog species, including one found at Tsinjoarivo and three other sites to the south, along Madagascar's eastern escarpment. 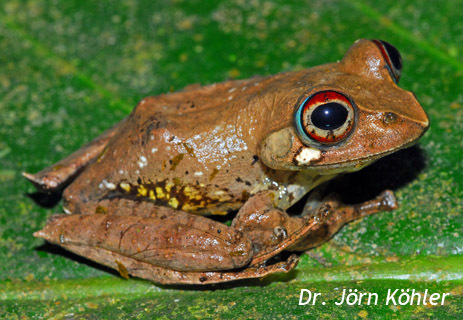 The new species described from Tsinjoarivo, Boophis popi, is a nocturnal treefrog found only in submontane rainforest (higher than 1000 m elevation), and has distinctive red eyes. The type specimen was collected at Tsinjoarivo in April 2010, in an expedition assisted by the Tsinjoarivo guides association MAITSOANALA, and is currently preserved for future study at Zoologische Staatssammlung München (Munich, Germany). 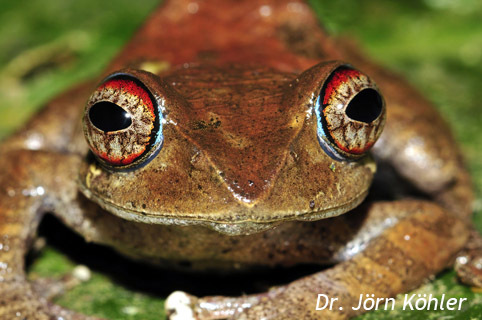 There are now over 70 known Boophis species - a group of small to larger, often very colourful treefrogs endemic to Madagascar and nearby islands. Many more species are thought to remain undescribed. This study, published in the journal Salamandra, was the work of a multidisciplinary team including Dr. Jörn Köhler of the Hessisches Landesmuseum in Darmstadt, Germany and Philip-Sebastian Gehring of the Technical University of Braunschweig, also in Germany. The article can be accessed online at the Salamandra website here, and the contents of this journal can be browsed here.